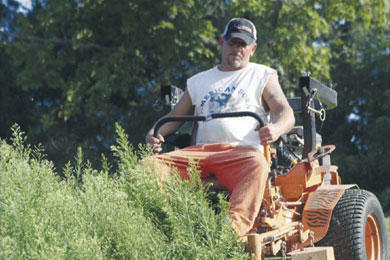 Bobby Cobb mows grass outside CCHS. Just because a person makes a mistake somewhere along the way doesn’t mean the individual is incapable of being a productive citizen and giving back to society. This is the philosophy of the Trusty program within the Cannon County Jail System, where convicts are regarded as worthy of trust and granted special privileges based on good behavior, according to Sheriff Darrell Young. These liberties are not the day-to-day privileges most Americans enjoy – shopping, dining out, and taking walks. The privileges enjoyed by trustys require work and manual labor. You have likely seen some of Cannon County’s trustys during your daily routine. These inmates are dressed in orange and can be seen doing any number of jobs throughout the county under the supervision of Ed Brown, jail administrator, or Daryl Fisher, county maintenance director. Just last week they were cutting weeds on a hill at Cannon County High School that had become so high it required multiple workers that spent more than two hours manicuring it. Nine Cannon County trusties did work at Cannon County High School Tuesday (Aug. 21). Two weeks prior just as many trusties spent more than two days cleaning around the football stadium, softball field and in the area around the field house. Work throughout the county accomplished by trustys is not limited to landscaping around the high school. These trusted individuals also have been responsible for doing work throughout Cannon County in order to assist organizations and governmental agencies whose work force is not great enough to accomplish the tasks. Brown does not ask for volunteers. These men and women must earn the opportunity to leave the jail and work to improve the community. They are considered reliable and faithful. They prove they are capable and ready to become productive citizens upon release and their time served as trustys is a step in that direction. There also are consequences for trustys who don’t fulfill their responsibilities. By all accounts, Cannon County trustys do a good job not only to remain within the program but because they take serious the responsibility to help others. Kudos for getting it right on the trusties v. trustees issue. I am so proud! The vast majority of inmates in Cannon County are our own people, our sons and daughters, our cousins, our neighbors. They will continue to be part of our community. We need to be concerned about their future as well as their punishment. What a positive effort in moving FORWARD in the right direction for the community, the jail and for the inmates (who are exactly as CutiePie said - or sons, daughters, cousins, neighbors and friends). Hats off to this "trusty program". My hat is off to Sheriff Young and his staff for improving the looks of not only the city and county, but for the great job he is doing. It is so nice to see positive acts and not so much bad press. The inmates are doing a great service for all of us. Keep up the good work. Your hard work is not going unnoticed.